CRS Publications is Hermann Geissel’s own publishing imprint. The site provides information about recent books and previous publications he has been involved in. It also contains personal pages dealing with his wide-ranging interests in all matters relating to Irish heritage, both natural and manmade. This website serves as a resource for Teachers and Students using Hermann’s book and will continue to offer updates and addenda as they become available. Visit www.agscience.ie - our new microsite for this publication containing all resources. You can also order a copy of the book online from this site. If you would like to contribute materials for inclusion on this site, please contact CRS Publications at the address provided below. The book in hand is the indispensable companion for the local enthusiast engaged in practical fieldwork, whether for his/her own enjoyment or with a view of adding to the knowledge and understanding of the archaeological landscape and an awareness of local heritage. Step by step attention is drawn to characteristics of field monuments whose details might easily be overlooked, while at the same time some basic background information is given about the subjects under investigation. A comprehensive array of monuments is covered, from abbeys to wedge-tombs, from cultivation ridges to forgotten roadways. A glossary of archaeological terms, a guide to Irish placenames, a time-line, overviews of disciplines of local studies, types of archaeological monuments and more provide the broader perspective. Distribution diagrams of selected monuments and a simple key for the identification of field monuments are also included. Illustrated with 150 colour photographs, this practical guide will also—on a rainy day—provide information and diversion as a delightful coffee table browser. 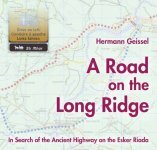 Hermann Geissel gives an absorbing account of his attempt to trace and map out the Sliè¶³ Mhor on the Esker Riada. This ancient routeway, extending from the Ath Cliath Cualann hurdle ford that gave Dublin its Irish name, to the Ath Cliath Maree at the mouth of the Clarin River on Galway Bay, formerly linked East and West while dividing the island into two similar halves. The result of this research were first presented as An tSli Mhor, a six-part television documentary on TG4, and since then the investigation has been revised and expanded into the present account. The outcome is a fascinating story of a personal odyssey undertaken by the author, together with historian Seamus Cullen, lavishly illustrated with striking photographs and equipped with helpful maps and informative appendices. Anecdotal humour and scholarly references sit together easily in the text, providing an enthralling and enlightening story of a little-known aspect of our medieval heritage. Packed full of information with stunning photographs from numerous locations all over Ireland, this site covers Hermann's varied interests which range from geology to archaeology, local history, flora and fauna. And, of course, old roads.